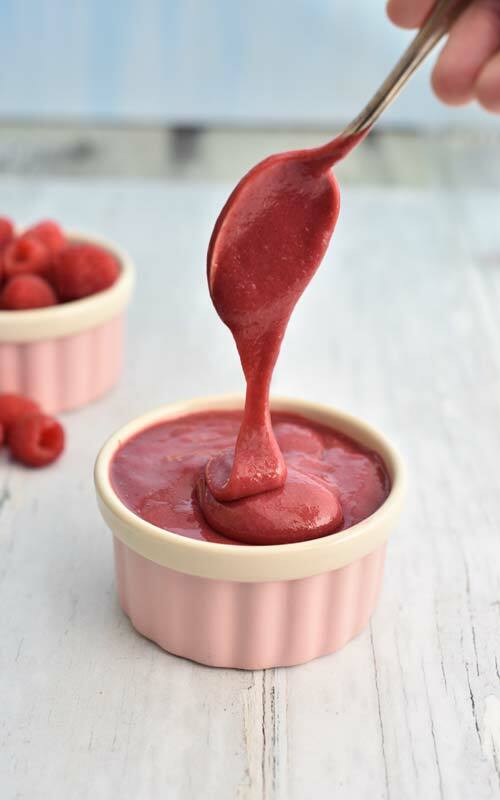 This tangy and sweet Raspberry Curd is perfect as is, eaten by spoonfuls. 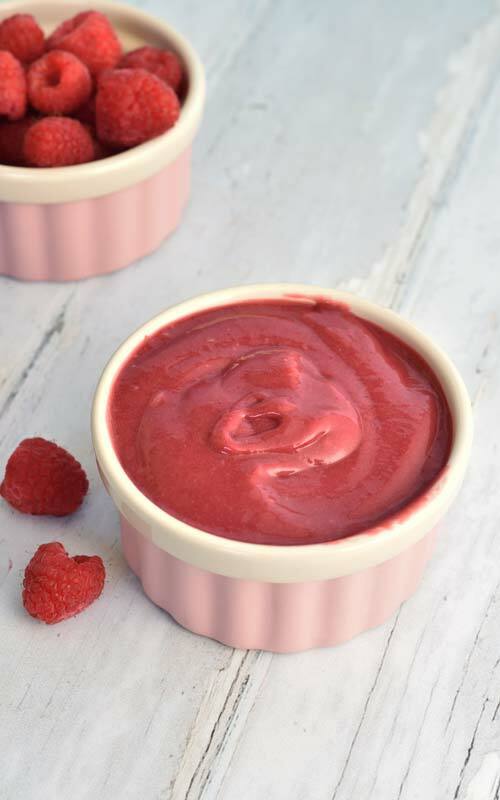 Creamy raspberry curd makes for a delicious filling for cakes, tarts and even cookies. 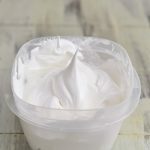 It pairs nicely with chocolate, meringues, pound cake, and I often add a few tablespoons into my yogurt, too. 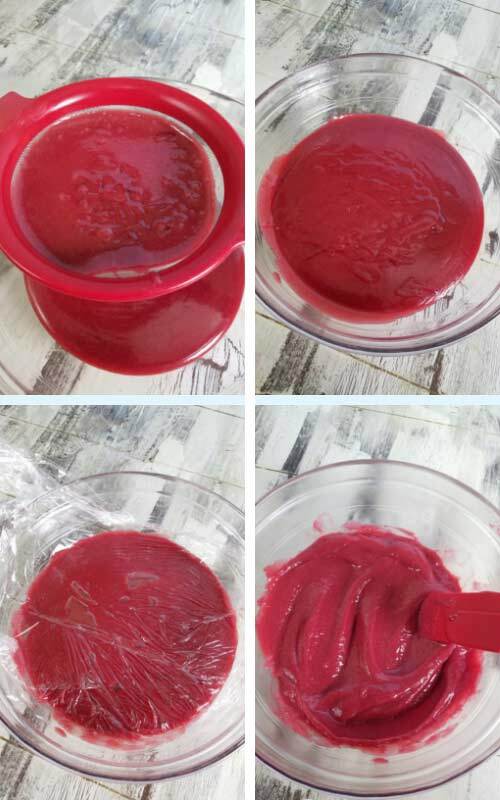 To make raspberry curd you need raspberry puree. 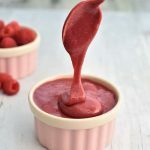 Fruit purees are super easy to make. You can use fresh or frozen raspberries. Personally I almost always use frozen ones. Fresh ones don’t usually last too long in my house. 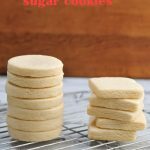 I gobble them up so quickly, not a chance I’d have enough to make a fruit puree. For plain fruit puree I cooked together 12oz. frozen raspberries with 1/4 cup water, until very soft. Then I used my immersion blender to break up soft raspberries into a more manageable, somewhat smoother texture. Press the mixture through a fine mesh sieve. To extract the most out of the raspberries you can also use double layered cheesecloth. Turn the pouch until no juice is coming out. Discard the seeds. If puree appears too liquidy, return it to heat and cook on low heat until it thickens slightly. 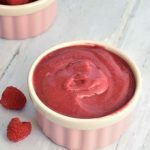 Fruit puree can be frozen for a later use. I often freeze it in cubes for a quick snack. You can use it to make fruit curds. Raspberry, strawberry, rhubarb, cranberry, blueberry. Whip up a delicious fruit mousse. 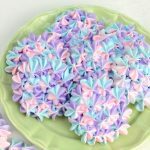 Make strawberry or raspberry royal icing. It’s absolutely delicious. Gummy bears – like Wine Raspberry Gummy Bears. 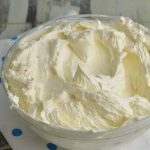 Delicious fruit buttercream. For instance, use fruit purees to make Strawberry, Raspberry Swiss Buttercream. 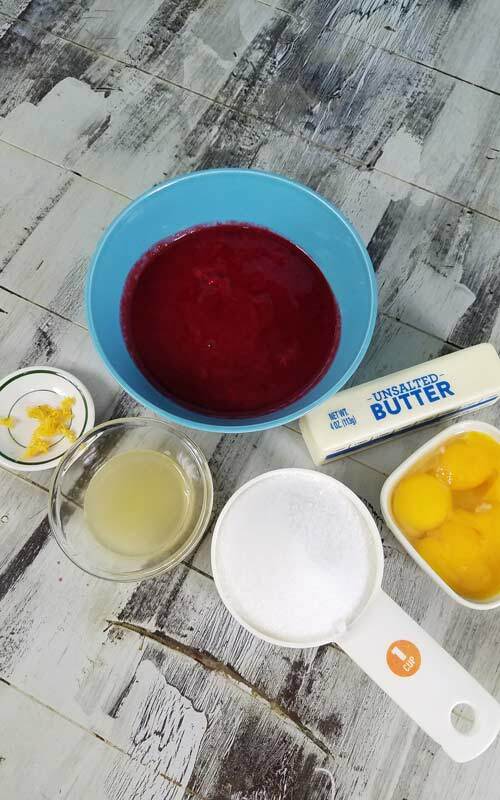 My favorite way to make lemon, raspberry, rhubarb or cranberry curd is to cream room temperature butter with sugar, add egg yolks, pinch of salt and lastly beat in fruit puree. This methods is great. In the mixing process egg protein molecules are coated with the fat. Fat protects them from overheating/cooking too quickly as it does from the acid that also encourages the bonding of protein molecules hence cooking too quickly. With curd I find it’s important that cooking happens slowly, resulting in velvety smooth texture. Ever since I started using this method I don’t have to worry about finding cooked egg bits in my cooked fruit curd. Even though it is curdled right after mixing it cooks into a satin smooth raspberry curd. Cook the mixture in a non reactive pan(stainless steel) on low heat, stirring frequently. At higher temperatures mixture heats up too quickly. Don’t let it boil it as it may curdle. Slower is better. Use a candy thermometer and keep an eye on the temperature. You don’t want the mixture to boil. Don’t rush it. Once it reaches 170F your raspberry curd is ready. Simple test includes coating the back of the wooden spoon with the curd and running a finger through. If curd stays separated it’s ready. However if it appears too thin even at 170F. Cook it for longer. Make sure to keep the temperature at 170F or slightly below. 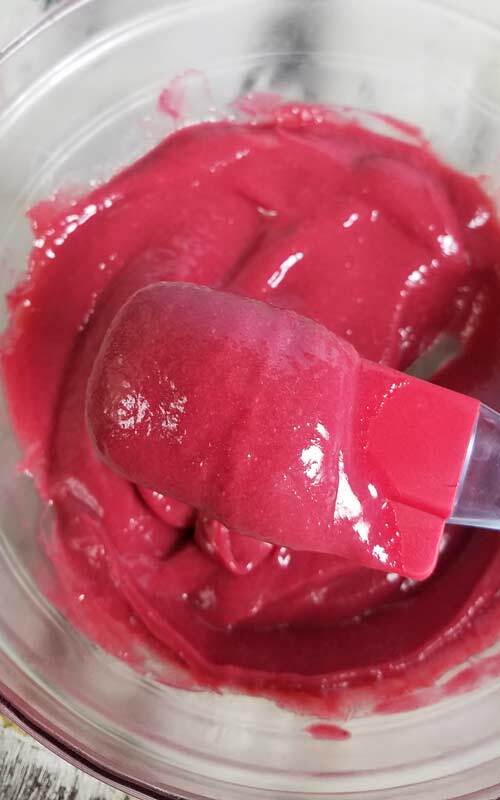 You’ll notice raspberry curd will deepen in color and it will gradually become thicker. Stir frequently. Even though I mentioned I rarely get cooked egg bits in my curds. 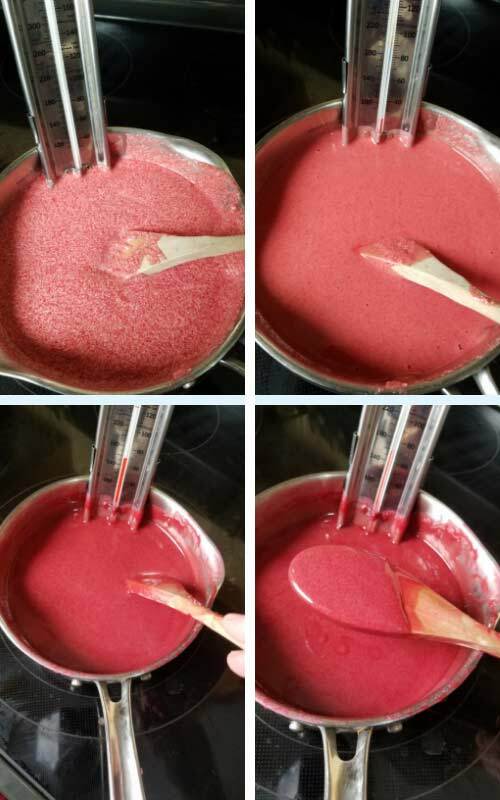 I always strain the cooked raspberry curd, just to be certain. Cover it with a plastic wrap and refrigerate overnight. It thickens as it cools. Makes 1 1/2 cups Delicious raspberry curd, store in the fridge for up to 2 weeks. 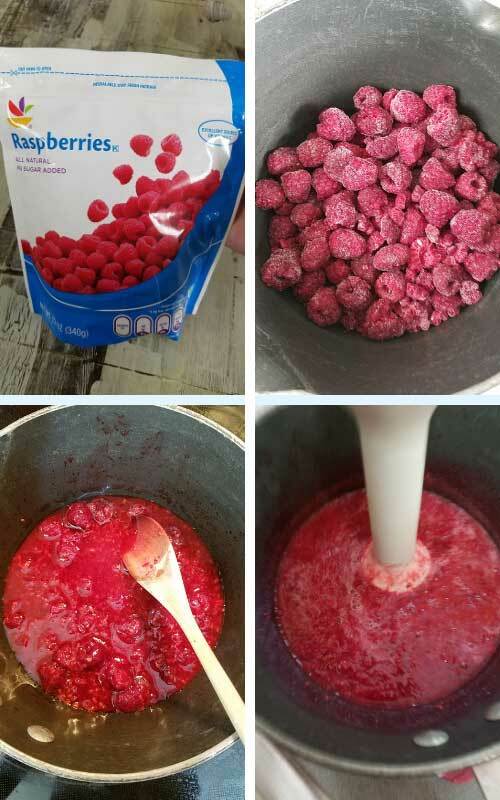 Cook frozen raspberries with 1/4 cup water until soft. About 10-15 minutes. Process in a small chopper or use immersion blender to break up the mixture. Press through a fine mesh sieve. 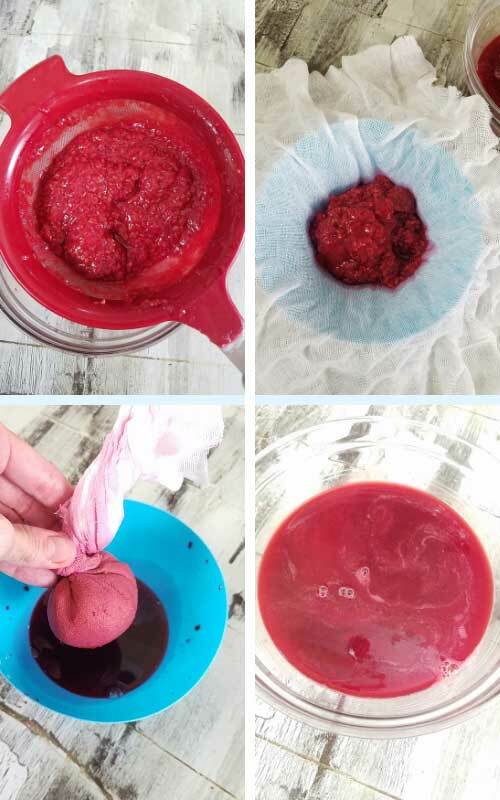 To extract the most out of the raspberry wrap the mixture into a double layer cheesecloth and twist the pouch until you no longer see raspberry liquid dripping into a bowl. If puree is too liquidy, heat it again and simmer for 10 minutes until it thickens slightly. Let cool and store in the fridge or freeze. 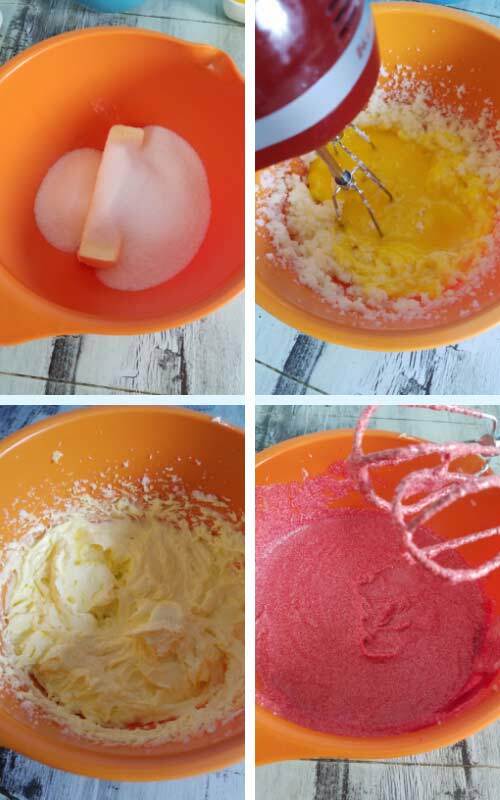 Beat room temperature butter with sugar, until smooth, add lemon zest, lemon juice, egg yolks, pinch of salt and raspberry puree. Mixture will look curdled. Pour the mixture into a non reactive sauce pan(stainless steel). Attach a candy thermometer and monitor temperature as you cook raspberry curd. Cook it on low heat. Make sure you heat it slowly. You don’t want it to boil as it may curdle. Keep it under 170F, as it reaches 170F it’s done. It the mixture appears too thin even at 170F, keep cooking, stirring frequently and keeping at 170F or slightly under. Mixture thickens and deepens in color as it cooks. 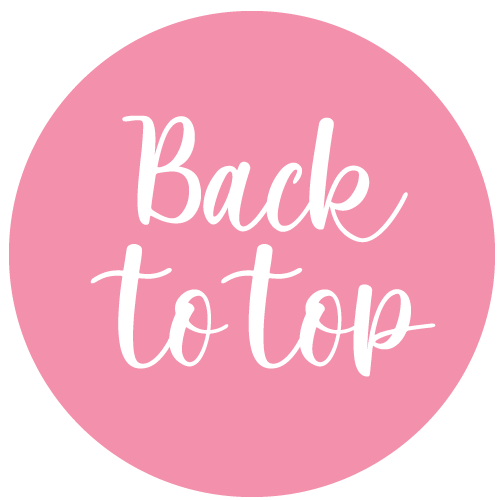 Simple Test – coat the back of the spoon and run a finger across the spoon. If it holds the trail then it’s done. 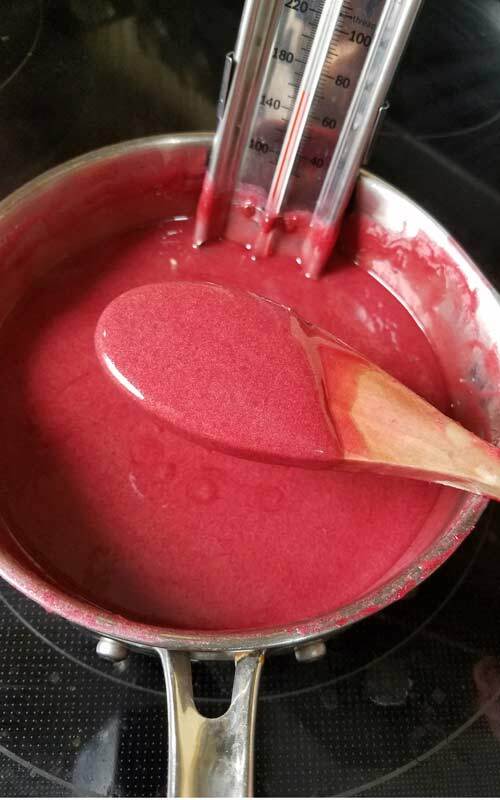 Raspberry curd can be be made ahead of time. Store it in the fridge in an airtight container, for up to 2 weeks. You can also process raspberry curd in jars, in a water bath for 15 minutes. Raspberry curd treated this way will last longer. Refrigerate for up to 3 months. Once opened, it’s good for up to 2 weeks. And doesn’t say when to add eggs. Why 6 or 7 eggs. What would determine the amount off eggs? Just updated that bit about eggs in the recipe. Thank for pointing that out. :-) If egg yolks are too small I’d suggest adding the 7th egg yolk. 1 1/2 cups. Forgot to add that bit in the recipe. Thanks.